Governor of Sindh Dr. Ishrat-ul-Ebad Khan announced to upgrade the KMDC to a University in next two to three weeks and a grant of Rs100million for the college. He also announced making the current principal Prof. Waqar Hussain Kazmi the university’s first Vice Chancellor. He was addressing the 4th Convocation of KMDC which was also attended by the Provincial Health Minister Dr. Sagheer Ahmed, MNA Abdul Waseem, MPA Abdul Moeed Siddiqui, Senator Abdul Haseeb Khan, Administrator Karachi Muhammad Hussain Syed, Metropolitan Commissioner Matanat Ali Khan, Vice Chancellor Karachi University Prof. Dr. Muhammad Qaiser, Principal KMDC Prof. Waqar H. Kazmi and others. The Governor of Sindh also announced an additional grant of Rs400million for development works of Phase-III that includes establishing an IT and Video Conferencing Lab, an auditorium, an administrative block and a ten storey building in KMDC. Degrees were awarded to 212 Doctors in MBBS and BDS whereas 13 Doctors Gold Medals and Rs25000 cash reward. 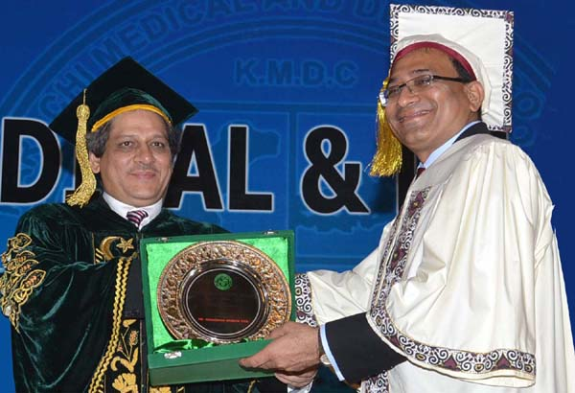 Earlier presenting the inaugural speech KMC Administrator Muhammad Hussain Syed congratulated the successful degree holders of college and thanked Chief Guest Governor of Sindh Dr. Ishrat-ul-Ebad Khan and guest of honor provincial health minister Dr. Sagheer Ahmed for attending the convocation. Administrator Karachi said in today’s world having a mere MBBS or BDS is not just sufficient and like other professionals they must continue updating their knowledge and better understanding of existing and new diseases. He said medical education in Pakistan is given an important consideration therefore we should enhance our capabilities and capacities in professional developments we should also work together formulating a policy to ensure good quality and ethical practices of doctors. He said as patron-in-chief of KMDC I m well aware of the problems faced by faculty members, staff and others and we are taking special measures on a priority basis for the resolution of all issues under the under the leadership and guidance of Governor of Sindh Dr. Ishrat-ul-Ebad Khan. He said the KMDC has reached its present enviable status in a very short time. The number of seats for MBBS has been increased from 100 to 250 similarly the number of BDS seats has been doubled from 50 to 100. Necessary legislation has been done to convert KMDC from college to a university titled the “City University of Medical Sciences.” He said KMDC is the only medical and dental college of our country which is being run and patronized by the Local Metropolitan Corporation where admissions are based on a transparent, accountable and total open merit policy. Speaking on this occasion Vice Chancellor K.U announced a two year masters program in public health for KMDC. Provincial Minister for Health Dr. Sagheer Ahmed, Principal KMDC Dr. Waqar H. Kazmi and others also spoke on the occasion. Copyright © 2019 Karachi Observer. All Rights Reserved. The Magazine Basic Theme by bavotasan.com.